Honors and awards from track represent Longhorn excellence and a portal to the past that reminds Longhorns that heritage shapes the present and empowers the future. 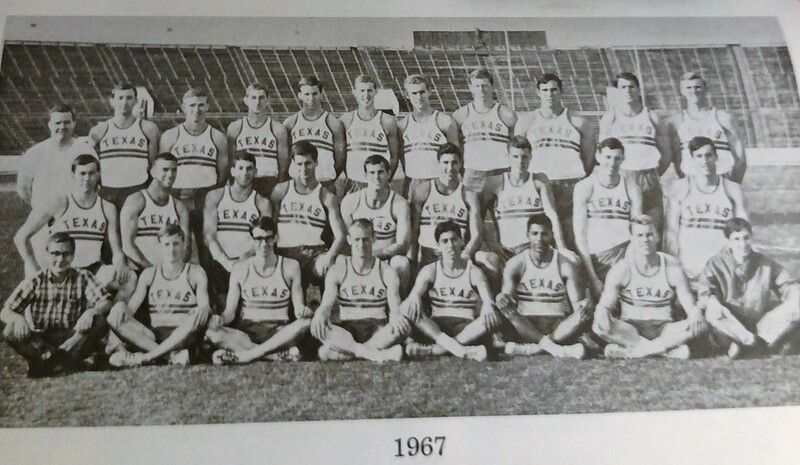 The History of Men's Track begins with a celebration of UT performers who represented the USA in the Olympics. Since Wrestling is not a sport covered by the Texas Sports network, I have not included wrestling on the TLSN site. However, Ralph Hammonds great accomplishment in Longhorn sports history should not be minimized or forgotten. He is the first Longhorn qualifier for the Olympics in the history of UT sports. I have included him in the track section because he was also a great pole Vaulter. Ralph Hammonds was a versatile athlete at the University of Texas, a pole vaulter on the track team and a wrestler. Hammonds was undefeated in 1928 and made the Olympic team. In 1943 Jerry Thompson's is the NCAA two-mile champion, a three-time All-American in the two-mile, a member of the 1948 U.S. Olympic team in the 5,000 meter event, and National Champion in 1943, '44,'45. He was inducted into the Texas Sports Hall of Fame in 1976. Coach Littlefield said that Jerry "was born with about 90 percent more endurance than most other boys." He........ was talented, competitive, and unselfish." 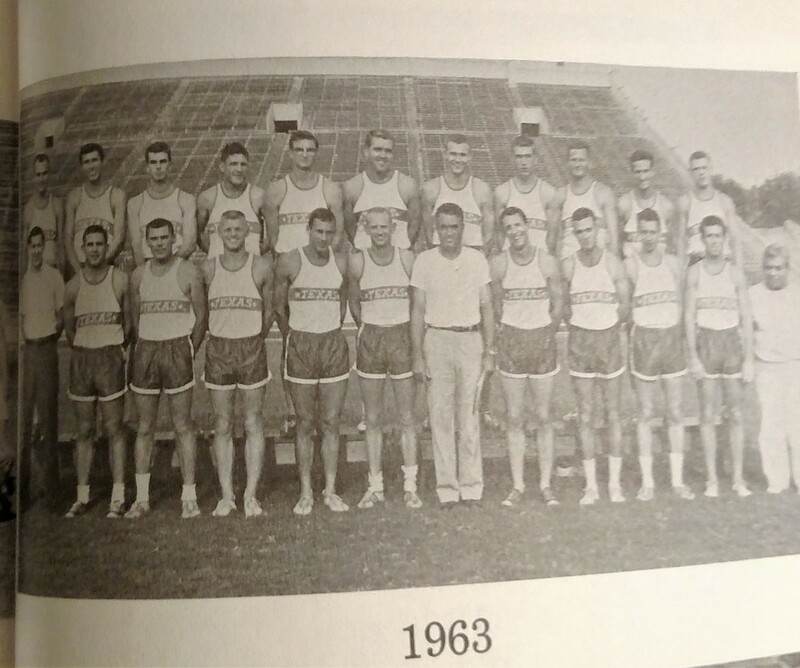 1952-1954 - Dean Smith is a sprinter and a halfback for the Longhorns' 1952 SWC championship football team. He is the first Longhorn track star to win a Olympic gold medal, and he is inducted into the Texas Sports Hall of Fame in 1985. After his track career, Dean uses an important contact (Jim Baumgardner) who is an OU friend to get a job as a Hollywood stuntman. Years Jim Baumgardner changes his Hollywood name to James Garner. Dean Smith is a instant success as a stunt man and hired by Steve McQueen, John Wayne, and Robert Redford. John Wayne says "this guy is amazing". "He can jump over a horse faster than you can say Jack Robinson." Dean Smith -Olympian and Stuntman. At 42 years of age Dean runs the 100 in the same time he ran it at 17 years of age (9.9). In 1958 Eddie Southern is the first person to run the quarter mile in under 45 seconds. Southern also anchors the 4 x 110 relay team that sets two world records in four years. He is inducted into the Texas Sports Hall of Fame in 1969. Coach Littlefield said "I was never associated with an athlete who could do so many things so well." In 1976 Johnny "Lam" Jones won a gold medal in the 4 x 100 relay. There is a special page for Johnny on this site. Trey Hardee participates in the 2008 and 2012 Olympic game. He receives the 2009 Jim Thorpe All-Around Award from DeLoss Dodds and in 2012 wins a silver medal in the Decathlon. Leo Manzano participates in the 2008 and 2012 Olympic games. He receives a silver medal in the 1500 in 2012. He wins the outdoor National Championship in 2005, 2007, and 2008, and he is a Cross Country All-American in 2007. Ryan Crouser wins the Gold medal in the Shot Put. 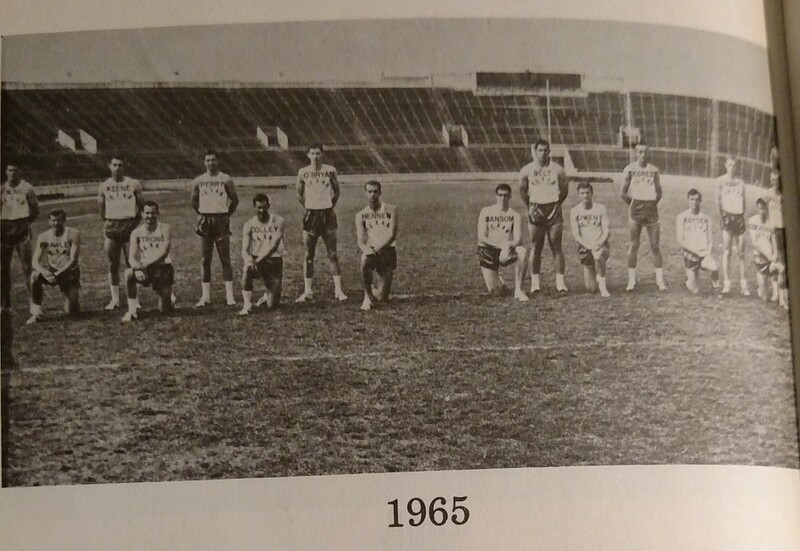 For those of you fascinated with track history the link below has a wealth of information from the magazine Track and Field. UT has produced 35 NCAA individual National champions. Coach Lovvern graduated from Stamford High school in Texas, attended Pepperdine where he won the national championship in the 1500 meter. He was an an assistant to Coach Littlefield for 15 years, before signing a 1 year contract to replace the retiring Littlefield. Ray Cunningham won the triple crown in the hurdles by winning at Drake, Kansas, and Texas relays. Longhorns finished 2nd in the SWC meet. Cunningham had the only Longhorn victory at the Texas Relays and the Horns finished second to ACC. Finished 5 in the SWC . After 11 years as an assistant track coach under Coach Littlefield and two years as head coach, Coach Lovvorn finished his coaching career at Texas. Rex Wilson had an outstanding career finishing first or second in 9 of 11 events. Captains Loy Gunter and James Cooper are between Price and Patterson. Jim Hudson and Ernie Koy join the track team after spring football training. Jim finish's as high as 4th in the Javelin at the track meets and Ernie Koy has one 2nd place finish in the shot put. Richard Romo recovers from injuries and sets SWC meet records in the mile and three mile runs. Texas becomes the first SWC team to integrate by offering two black track stars scholarships. Left to Right: Rudy Alaniz, David Matin, L.J. Cohen. All are from Corpus Christi. Left to Right: Rudy Alaniz, David Matin, L.J. Cohen. All are from Corpus Christi. Photo compliments of L.J. Cohen. This was the first time in the history of Texas Track that a relay team scored points at the Nationals. 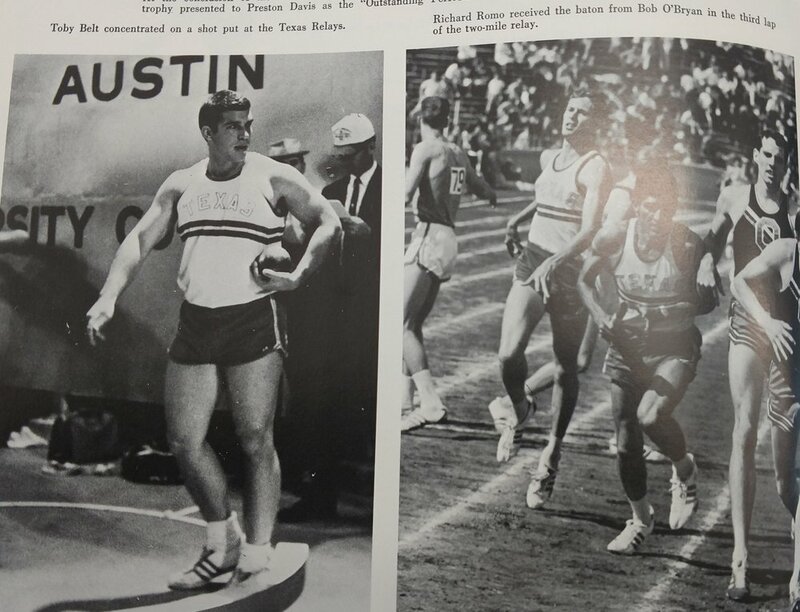 The Longhorns were voted the most outstanding team of the Texas Relays and Dave Morton was the outstanding athlete. Dave Morton did not win any National Championships, but he is one of the most talented Longhorns ever in the 440 and 880. A team player he is a major reason for many relay records at UT during his 4 years. Texas Relays were a bust for the Longhorns!! Three half-milers - Mike Mosley, David Matina, and John Robertson owned the 880 in the conference with Matina setting the SWC mark in this event. Horn mile relay team was invited to New York and Cleveland for national exposure. Co-Captain Bill Elliott sets finishes second in the high jump at the SWC meet. The Longhorn shot putters finished 1-2-3-5 at the SWC meet. Randy Nichols sets a Longhorn record in the shot put. This was one of the best Texas Relays ever. 100 teams including 11 women and 1300 athletes set many Relay records . The Aggies dominated the University division. Jack Patterson resigns to become Athletic Director at Baylor and Cleburne Price is offered the UT Head coaching job.